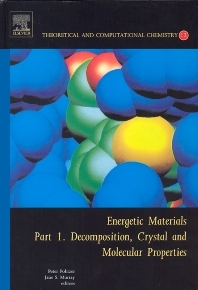 This volume provides an overview of current research and recent advances in the area of energetic materials, focusing on decomposition, crystal and molecular properties. The contents and format reflect the fact that theory, experiment and computation are closely linked in this field. Since chemical decomposition is of fundamental importance in energetic performance, this volume begins with a survey of the decomposition processes of a variety of energetic compounds. This is followed by detailed studies of certain compounds and specific mechanisms, such as nitro/aci-nitro tautomerism. Chapter 6 covers the transition from decomposition to crystal properties, with molecular dynamics being the primary analytical tool. The next several chapters deal with different aspects of the crystalline state, again moving from the general to particular. There is also a discussion of methods for computing gas, liquid and solid phase heats of formation. Finally, the last portion of this volume looks at the potential of high-nitrogen molecules as energetic systems; this has been of considerable interest in recent years.